Fez (Arabic: فاس‎, Berber: Fas, ⴼⴰⵙ, French: Fès) is a city in northern inland Morocco and the capital of the Fas-Meknas administrative region. It is the second largest city in Morocco after Casablanca, with a population of 1.4 million (2014). Located to the northeast of Atlas Mountains, Fez is situated at the crossroad of the important cities of all regions; 206 km (128 mi) from Tangier to the northwest, 246 km (153 mi) from Casablanca, 169 km (105 mi) from Rabat to the west, and 387 km (240 mi) from Marrakesh to the southwest which leads to the Trans-Saharan trade route. It is surrounded by the high grounds, and the old city is penetrated by the River of Fez flowing from the west to east. Fez was founded under the Idrisid rule during the 8th-9th century. It consisted of two autonomous and competing settlements. The migration of 2000 Arab families in the early 9th century gave the nascent city its Arabic character. After the downfall of the Idrisid dynasty, several empires came and went until the 11th century when the Almoravid Sultan Yusuf ibn Tashfin united the two settlements and rebuilt the city, which became today's Fes el Bali quarter. Under the Almoravid rule, the city gained a reputation for the religious scholarship and the mercantile activity. Fez was expanded during the Almohad rule and became the largest city in the world during 1170-1180 with the estimated population of 200,000. Fez reached its zenith in the Marinid-era, regaining the status as the capital. Numerous madrasas, mosques, zawiyas and city gates were constructed which survived up until today. These buildings are considered the hallmarks of Moorish and Moroccan architectural styles. Marinid sultans also founded Fes Jdid quarter, where newer palaces and gardens were established. During this time, the Jewish population of the city grew as well, with the Mellah (Jewish quarter) attracting the Jewish migrants from other North African regions. After the overthrow of the Marinid dynasty, the city largely declined and replaced by Marrakesh for political and cultural influence, but remained as the capital under the Wattasids and modern Morocco until 1912. Today, the city largely consists of two old medina quarters, Fes el Bali and Fes Jdid, and modern urban area of Ville Nouvelle constructed during the French colonial era. The medina of Fez is listed as a World Heritage Site and is believed to be one of the world's largest urban pedestrian zones (car-free areas). It has the University of Al Quaraouiyine which was founded in 859 and the oldest continuously functioning university in the world. It also has Chouara Tannery from the 11th century, one of the oldest tanneries in the world. The city has been called the "Mecca of the West" and the "Athens of Africa," a nickname it shares with Cyrene in Libya. Fez or Fas is possibly related to the Berber name Fazaz of the region in which it was built. The name is itself derived from an ancient Berber tribe, called the Banu Fazaz in Arabic chronicles. An unfounded myth is that it was derived from the Arabic word فأس Faʾs which means pickaxe, which legends say Idris I of Morocco used when he created the lines of the city. One noticeable thing was that the pickaxe was made from silver and gold. During the rule of the Idrisid dynasty, Fez consisted of two cities: Fas, founded by Idris I, and al-ʿĀliyá, founded by his son, Idris II. During Idrisid rule the capital city was known as al-ʿĀliyá, with the name Fas being reserved for the separate site on the other side of the river; no Idrisid coins have been found with the name Fez, only al-ʿĀliyá and al-ʿĀliyá Madinat Idris. It is not known whether the name al-ʿĀliyá ever referred to both urban areas. It wasn't until 1070 that the two agglomerations were united and the name Fas was used for the combined site. VIew of the old medina, with the minaret of Zaouia Moulay Idriss II on the left, where it commemorates Idris II, the founder of Fez. The city was founded on a bank of the Jawhar river by Idris I in 789, founder of the Idrisid dynasty. His son, Idris II (808), built a settlement on the opposing river bank. These settlements would soon develop into two walled and largely autonomous sites, often in conflict with one another: Madinat Fas and Al-'Aliya. In 808 Al-'Aliya replaced Walili as the capital of the Idrisids. Arab emigration to Fez, including 800 Andalusi families of Berber descent in 817–818 expelled after a rebellion against the Umayyads of Córdoba, Andalusia, and 2000 Arab families banned from Kairouan (modern Tunisia) after another rebellion in 824, gave the city its Arabic character. The Andalusians settled in what was called the Fez, while the Tunisians found their home in al-'Aliya. These two waves of immigrants would subsequently give their name to the sites 'Adwat Al-Andalus and 'Adwat al-Qarawiyyin. 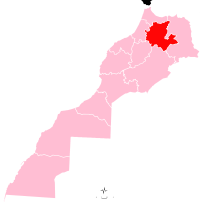 With the influx of Arabic-speaking Andalusians and Turnisians, the majority of the population was Arab, but rural Berbers from the surrounding countryside settled there throughout this early period, mainly in Madinat Fas (the Andalusian quarter) and later in Fes Jdid during the Marinid period. Upon the death of Idris II in 828, the dynasty’s territory was divided among his sons. The eldest, Muhammad, received Fez. The newly fragmented Idrisid power would never again be reunified. During Yahya ibn Muhammad's rule in Fez the Kairouyine mosque, one of the oldest and largest in Africa, was built and its associated University of Al Quaraouiyine was founded (859). Comparatively little is known about Idrisid Fez, owing to the lack of comprehensive historical narratives and that little has survived of the architecture and infrastructure of early Fez (Al-'Aliya). The sources that mention Idrisid Fez, describe a rather rural one, not having the cultural sophistication of the important cities of Al-Andalus and Ifriqiya. In the 10th century, the city was contested by the Caliphate of Córdoba and the Fatimid Caliphate of Tunisia, who ruled the city through a host of Zenata clients. The Fatimids took the city in 927 and expelled the Idrissids, after which their Miknasa were installed there. The Miknasa were driven out of Fez in 980 by the Maghrawa, their fellow Zenata, allies of the Caliphate of Córdoba. It was in this period that the great Andalusian ruler Almanzor commissioned the Maghrawa to rebuild and refurnish the Al-Kairouan mosque, giving it much of its current appearance. According to the Rawd al-Qirtas and other Marinid era sources, the Maghrawi emir Dunas Al-Maghrawi filled up the open spaces between the two medinas and the banks of the river, dividing them with new constructions. Thus, the two cities grew into each other, being now only separated by their walls and the river. His sons fortified the city to a great extent. This could not keep the Almoravid emir Ibn Tashfin from conquering it in 1070, after more than a decade of battling the Zenata warriors in the area and constant besieging of the city. In 1033, several thousand Jews were killed in the Fez Massacre. Madinat Fas and Al-'Aliya were united in 1070 by the Almoravid dynasty: The walls dividing them were destroyed, bridges connecting them were built, and connecting walls were constructed that unified the medinas. Under Almoravid patronage the largest expansion and renovation of the Great Mosque of Kairouan took place (1134-1143). Although the capital was moved to Marrakesh under the Almoravids, Fez acquired a reputation for Maliki legal scholarship and became an important centre of trade. Almoravid impact on the city's structure was such that the second Almoravid ruler, Yusuf ibn Tashfin, is often considered to be the second founder of Fez. Like many Moroccan cities, Fez was greatly enlarged during the Almohad Caliphate and saw its previously dominating rural aspect lessen. This was accomplished partly by the settling there of Andalusians and the further improvement of the infrastructure. At the start of the 13th century they broke down the Idrisid city walls and constructed new ones, which covered a much wider space. These Almohad walls exist to this day as the outline of Fes el Bali. Under Almohad rule the city grew to become one of the largest in the world between 1170 and 1180, with an estimated 200,000 people living there. In 1250 Fez regained its capital status under the Marinid dynasty. In 1276 after a massacre by the population to kill all Jews that was stopped by intervention of the Emir, they founded Fes Jdid, which they made their administrative and military centre. Fez reached its golden age in the Marinid period, which marked the beginning of its official, historical narrative. It is from the Marinid period that Fez's reputation as an important intellectual centre largely dates. They established the first madrasas in the city and country. The principal monuments in the medina, the residences and public buildings, date from the Marinid period. The madrasas are a hallmark of Marinid architecture, with its striking blending of Andalusian and Almohad traditions. Between 1271 and 1357 seven madrassas were built in Fez, the style of which has come to be typical of Fassi architecture. Ibn Battuta described the city of Fa's, which he passed through on his way to Sijilmasa. Jews of Fez in the 1900s. Mellah was a traditional Jewish quarter of the city. The Jewish quarter of Fez, the Mellah was built in 1438, near the royal residence in Fez Jdid. The Mellah at first consisted of Jews from Fez el Bali and soon saw the arrival of Berber Jews from the Atlas range and Jewish immigrants from al-Andalus. The Marinids spread the cult of Idris I and encouraged sharifism, financing sharifian families as a way to legitimize their (in essence secular) rule: From the 14th century onwards hundreds of families throughout Morocco claimed descent from Idris I, especially in Fez and the Rif mountains. In this regard they can be seen as the enablers of the latter sharifian dynasties of Morocco. The 1465 Moroccan revolt in 1465 overthrew the last Maranid sultan. In 1474 the Marinids were replaced by their relatives of the Wattasid dynasty, who faithfully (but for a large part unsuccessfully) continued Marinid policies. After the fall of the Marinids, the city remained the capital of Morocco under the Wattasids. However, in the 16th century, the Saadis, based in Marrakech, would attempt to overthrow the Wattasids. In the meanwhile, the Ottoman Empire came close to Fez after the conquest of Oujda in the 16th century. In January 1549 the Saadi sultan Mohammed ash-Sheikh took Fez and ousted the last Wattasid sultan Ali Abu Hassun. They later retook the city in 1553 with Ottoman support. However, this reconquest was short-lived, and in 1554 the Wattasids were decisively defeated in the battle of Tadla by the Saadis. The Ottomans would try to invade Morocco after the assassination of Mohammed ash-Sheikh in 1558, but were defeated by his son Abdallah al-Ghalib at the battle of Wadi al-Laban north of Fez. Hence, Morocco remained the only North-African state to deter and defeat the Ottomans. After the death of Abdallah al-Ghalib a new power struggle would emerge, after Abd al-Malik would take Fez with Ottoman support and oust his nephew Abu Abdullah. The latter would flee to Portugal where he asked king Sebastian of Portugal for help to regain his throne. This would lead to the Battle of Alcacer Quibir where Abd al-Malik's army would defeat the invading Portuguese army with the support of his Ottoman allies, ensuring Moroccan independence. Abd al-Malik himself also died during the battle and would be succeeded by Ahmad al-Mansur. After the fall of the Saadi dynasty (1649), Fez was a major trading post of the Barbary Coast of North Africa. Until the 19th century it was the only source of fezzes (also known as the tarboosh). Then manufacturing began in France and Turkey as well. Originally, the dye for the hats came from a berry that was grown outside the city, known as the Turkish kızılcık or Greek akenia (Cornus mas). Fez was also the end of a north-south gold trading route from Timbuktu. Fez was a prime manufacturing location for embroidery and leather goods such as the Adarga. The city became independent in 1790, under the leadership of Yazid (1790–1792) and later of Abu´r-Rabi Sulayman. In 1795 control of the city returned to Morocco. Fez took part in a rebellion in 1819-1821, led by Ibrahim ibn Yazid, as well as in the 1832 rebellion led by Muhammad ibn Tayyib. Following the implementation of the Treaty of Fez, the city was heavily damaged in the 1912 Fez riots and belonged to French Morocco until 1956. Fez was the capital of Morocco until 1925. Rabat then remained the capital even after Morocco achieved independence in 1955. Despite its traditional character, there is a modern section: the Ville Nouvelle or "New City". Today it is a bustling commercial center. The popularity of the Fez has increased since present ruler, King Mohammed VI of Morocco, married a woman from Fez, Salma Bennani. Place Lalla Yeddouna at the heart of the Medina is currently undergoing reconstruction and preservation measures following a design competition sponsored by the Millennium Challenge Corporation (Washington D.C.) and the Government of the Morocco. The construction projects scheduled for completion in 2016 encompass historic preservation of particular buildings, construction of new buildings that fit into the existing urban fabric and regeneration of the riverfront. The intention is to not only preserve the quality and characteristics of the UNESCO World Heritage Site, but to encourage the development of the area as a sustainable, mixed-use area for artisanal industries and local residents. Located by the Atlas Mountains, Fez has a hot-summer Mediterranean climate (Köppen climate classification Csa) with a strong continental influence, shifting from relatively cool and wet in the winter to dry and hot days in the summer months between June and September. Rainfall can reach up to 800 mm (31 in) on good years. The winter highs typically reach around 15 °C (59 °F) in December–January. Frost is not uncommon during the winter period. The highest and lowest temperatures ever recorded in the city are 46.7 °C (116 °F) and −8.2 °C (17 °F), respectively. (see weather-table below). Fez's climate is strongly similar to that of Seville and Córdoba, Andalusia, Spain. Snowfall on average occurs once every 3 to 5 years. Fez recorded snowfall in three straight years in 2005, 2006 and 2007. Oulad Tayeb 231.81.01. Rural commune 3233 19144 3 19141 5056 residents live in the center, called Ouled Tayeb; 14088 residents live in rural areas. Sidi Harazem 231.81.05. Rural commune 982 5133 0 5133 3317 residents live in the center, called Skhinate; 1816 residents live in rural areas. The interior of Zaouia Moulay Idriss II, where commemorates Idris II, the founder of Fez. The historic city of Fez consists of Fes el-Bali, the original city founded by the Idrisid dynasty on both shores of the Oued Fes (River of Fez) in the late 8th and early 9th centuries, and the smaller Fez el-Jdid, founded on higher ground to the west in the 13th century. It is distinct from Fez's now much larger Ville Nouvelle (new city) originally founded by the French. Fes el-Bali is the site of the famous Qarawiyyin University and the Mausoleum of Moulay Idris II, the most important religious and cultural sites, while Fez el-Jdid is the site of the enormous Royal Palace, still used by the King of Morocco today. These two historic cities are linked together and are usually referred to together as the medina of Fez, though this term is sometimes applied more restrictively to Fes el-Bali only. [a] Fez is becoming an increasingly popular tourist destination and many non-Moroccans are now restoring traditional houses (riads and dars) as second homes in the medina. Fez is also considered the cultural and spiritual capital of Morocco. In 1981, the United Nations Educational, Scientific and Cultural Organization (UNESCO) proclaimed Medina of Fez a World Cultural Heritage site, as "[they] include a considerable number of religious, civil and military monuments that brought about a multi-cultural society. This architecture is characterised by construction techniques and decoration developed over a period of more than ten centuries, and where local knowledge and skills are interwoven with diverse outside inspiration (Andalousian, Oriental and African). The Medina of Fez is considered as one of the most extensive and best conserved historic towns of the Arab-Muslim world." The interior view of Al-Attarine Madrasa built by the Marinid sultan Abu al-Hassan in 1323-1325. The city has traditionally retained the influential position as a religious capital in the region, exemplified by the Madrasa of Al Quaraouiyine which was established in 859 by Fatima al-Fihri originally as a mosque. The madrasa is the oldest existing, continually operating and the first degree awarding educational institution in the world according to UNESCO and Guinness World Records. During the Marinid rule, Fez was designated as the political and religious capital of the empire, partly due to the Sultan Abu Yaqub Yusuf's intention to mitigate the tension between the ulamas in the old city. This had led to the great attention by the government to the construction of the madrasas following the Maliki orthodoxy, which resulted in the unprecedented prosperity of the city's religious institutions. The first madrasa built during the Marinid era was Saffarin Madrasa in Fes el Bali by Abu Yaqub Yusuf. Sultan Abu al-Hassan was the most prolific patron of the madrasa construction, completing the Al-Attarine, Mesbahiyya and Sahrij Madrasa in Fez alone, and several other madrasas as well in other cities such as Salé and Meknes. His son Abu Inan Faris built the famed Bou Inania Madrasa, and by the time of his death, every major city in the Marinid Empire had at least one madrasa. The additional library was established as well for the Madrasa of Al Quaraouiyine in 1349, which stores a large selection of valuable manuscripts dating back to the medieval era. The largest madrasa in the medina is Shiratin Madrasa commissioned by the Alaouite sultan Al-Rashid in 1670, which is the only non-Marinid foundation besides the Madrasa of Al Quaraouiyine. City walls of Fez. The bastion on the right is Kasbah Cherarda. The entire medina of Fez was heavily fortified with crenelated walls which equip heavy watchtowers and gates, a pattern of urban planning which can be seen in Salé and Chellah as well. City walls were placed into the current positions during the 11th century, under the Almoravid rule. During this period, the two divided cities of Fez were united under the single enclosure. The structures of Almoravid era were later destroyed and subsequently rebuilt by the Almohad dynasty in the 12th century. These fortifications were completed and formed into the current shape under the Marinid rule during the 12th to 16th centuries, along with the founding of Fes Jdid. The gates of Fez are adjacent to these city walls, and guarded by the military detachments and shut at night. During its development in the 9th century, Fes el Bali was enclosed by the eight main gates. After the foundation of Fes Jdid by the Marinids in the 13th century on the outside of these gates, new walls and three new gates such as Bab al-Amer were established as perimeters between these two medinas. The construction of the new gates employed the Christian labor. Additional gates were constructed during the Alaouite era, most notably Bab Bou Jeloud in 1913. Other remaining gates of Fez today include Bab el-Seba, Bab Semmarine, Bab al-Fetouh, Bab Mahrouk and Bab Chorfa. Bab Chorfa, the entrance gate to Kasbah An-Nouar. Open-air markets are held in front of the gate. Along with the city walls and gates, several forts were constructed as defensive perimeters of the medina during the different time periods. The military watchtowers built in its early days during the Idrisid era were relatively small. However, the city rapidly developed as the military garrison center of the region during the Almoravid era, in which the military operations were commanded and carried out to other North African regions and Southern Europe to the north, and Senegal river to the south. Subsequently, it led to the construction of numerous forts, kasbahs, and towers against the foreign invasions. Kasbah in the context of Maghrebi region is the traditional military structure for fortification, military preparation, and command and control. Some of them were occupied as well by the citizens, certain tribal groups, and merchants. Throughout the history, 13 kasbahs were constructed surrounding the old city. The most prominent among them is Kasbah An-Nouar, which dates back to the Almohad era, located at the western or north-western tip of Fes el-Bali. Today, the kasbah is a residential district much like the rest of the medina. The kasbah is equipped with the Friday Mosque and Bab Chorfa entrance gate. Other kasbahs including Kasbah Cherarda located on the outskirts of Fes el Bali. It was first established during the Saadi era in the 16th century and later refurbished by the Alaouite Sultan Mulai al-Rashid as a fortress. Kasbah Dar Debibagh is a relatively new kasbah built in 1729 during the Alaouite era at 2km from the city wall in a strategic position. To the north, there is Borj Nord which dates back to the Saadi era and among the largest defensive structures in the city, now refurbished as a military museum. Leather tanning in Chouara Tannery. Since the inception of the city, tanning industry has been continually operating in the same fashion as it did in the early centuries. Today, the tanning industry in the city is considered one of the main tourist attractions. There are three tanneries in the city, largest among them is Chouara Tannery near the Saffarin Madrasa along the river, built in the 11th century. The tanneries are packed with the round stone wells filled with dye or white liquids for softening the hides. The leather goods produced in the tanneries are exported around the world. Located in the heart of Fes el Bali, the Zaouia of Moulay Idriss II is a zaouia (a shrine and religious complex; also spelled zawiya), dedicated to and contains the tomb of Idris II (or Moulay Idris II when including his sharifian title) who is considered the main founder of the city of Fez. Within the medina quarter, there exists as well the Zaouia of Sidi Ahmed al-Tijani, which commemorates Sidi Ahmed al-Tijani, the founder of Tijaniyyah tariqa from the 18th century. To the north, there are Marinid Tombs built during the 14th century as a necropolis for the Marinid sultans. There are numerous old mosques in the medina, some of which are adjacent to the respective madrasa, zaouia or kasbah. Among the oldest are the Mosque of Al-Qarawiyiin, the mosque adjacent to its university, which dates back to 857, the Andalusian Mosque which dates back to 859-860 with the minaret erected in 956, Masjid Ali Boughaleb from 1090, Bou Jeloud Mosque from 1191-1214, and the Mosque of the Kasbah en-Nouar (or Kasbah Filala) from around 1200. A number of mosques from the important Marinid era, when Fes el-Jdid was created to be the capital of Morocco, and include the Great Mosque of Fez Jdid from 1279, the Abu al-Hassan Mosque from 1341, the Chrabliyine Mosque from 1342, the al-Hamra Mosque from 1350, and the Bab Guissa Mosque from the reigh of Abu al-Hassan (1331-1351) (but modified in later centuries). Another major but more recent mosque is the R'cif Mosque built in the reign of Moulay Slimane (1793-1822). The Zaouia of Moulay Idriss II and the Zaouia of Sidi Ahmed al-Tijani have their adjacent mosques as well. The Jewish quarter (Mellah) is the site of the 17th-century Ibn Danan Synagogue. Gates of the Alaouite Royal Palace (Dar al-Makhzen). The old city of Fez includes more than a hundred funduqs (traditional inns) for visiting merchants and travelers alike. Among the prominent funduqs are Funduq al-Najjariyyin, which was built in the 18th century by the Alaouite Sultan Amin Adiyil, in order to provide the stay and the storage facility for merchants. Older funduqs include Funduq Achich from the 16th century. There are other numerous funduqs and riads utilized as hotels for the tourism industry. Some of the historical private residences have been turned into tourist attractions, among them is Alami House of the 17th-18th century which features prevalent Moroccan architectural style. As a former administrative seat, the city contains several palaces as well. Dar Batha is a former palace completed in 1897 by the Alawouite Sultan Moulai Abdelaziz, and turned into a museum in 1915 with around 6,000 collections. On Fes Jdid quarter, there is the 80 hectare Royal Palace, or Dar al-Makhzen, with imposing gate but not open to the public. The University of Al Quaraouiyine is the oldest continually-operating university in the world. The al-Karaouine mosque was founded by Fatima al-Fihri in 859 with an associated school, or madrasa, which subsequently became one of the leading spiritual and educational centers of the historic Muslim world. It became a state university in 1963, and remains an important institution of learning today. Sidi Mohamed Ben Abdellah University is a public university that was founded in 1975 and has two primary campuses in the city (Dhar El Mehraz and Sais). The city has a French international school, Groupe scolaire Jean-de-La-Fontaine, serving moyenne section through collège (junior high school). Gare de Fes, train station in the modern urban area of Fez. The city is served by Saïss Airport. It also has an ONCF train station with lines east to Oujda and west to Tangier and Casablanca. Fez has two football teams, MAS Fez (Fés Maghrebi) and Wydad de Fès (WAF). They both play in the Botola the highest tier of the Moroccan football system and play their home matches at the 45,000 seat Complexe Sportif de Fès stadium. The MAS Fez basketball team competes in the Nationale 1, Morocco's top basketball division. ^ Medina is the Arabic word for "city", which in former French colonies in North Africa is also used to refer to the old part of a city, as the French largely generally built new cities (Ville Nouvelles) next to them and left the historic cities intact. ^ "Fez, Kingdom of Morocco", Lat34North.com & Yahoo! Weather, 2009, webpages: L34-Fes and Yahoo-Fes-stats. ^ UNESCO World Heritage Centre. "Medina of Fez – UNESCO World Heritage Centre". Whc.unesco.org. Retrieved 2017-09-20. ^ "Note de présentation des premiers résultats du Recensement Général de la Population et de l'Habitat 2014" (in French). High Commission for Planning. 20 March 2015. p. 8. Retrieved 9 October 2017. ^ "History of Fes". Archived from the original on 2011-03-16. Retrieved 2010-12-23. ^ Cities of the Middle-East and North-Africa A historical enceclopedia. Michael Dumper, Bruce E. Stanley, pagina 151. ^ Bigon, Liora. Place Names in Africa: Colonial Urban Legacies, Entangled Histories. Springer. p. 83. ISBN 9783319324852. ^ "An architectural Investigation of Marinid and Watasid Fes" (PDF). Etheses.whiterose.ac.uk. p. 19. Retrieved 22 August 2018. ^ A History of the Maghrib in the Islamic Period By Jamil Mir'i Abun-Nasr. p. 51. ^ Merriam Webster's Collegiate Encyclopedia. p.574. ^ "An architectural Investigation of Marinid and Watasid Fes" (PDF). Etheses.whiterose.ac.uk. p. 16. Retrieved 22 August 2018. ^ "An architectural Investigation of Marinid and Watasid Fes" (PDF). Etheses.whiterose.ac.uk. p. 22. Retrieved 22 August 2018. ^ Battutah, Ibn (2002). The Travels of Ibn Battutah. London: Picador. p. 281. ISBN 9780330418799. ^ "An architectural Investigation of Marinid and Watasid Fes" (PDF). Etheses.whiterose.ac.uk. p. 5. Retrieved 22 August 2018. ^ "3. North Africa, 1504-1799. 2001. The Encyclopedia of World History". 19 December 2007. Archived from the original on 19 December 2007. Retrieved 22 August 2018. ^ H. Z(J. W.) Hirschberg (1981). A history of the Jews in North Africa: From the Ottoman conquests to the present time, edited by Eliezer Bashan and Robert Attal. BRILL. p. 318. ISBN 90-04-06295-5. ^ "Morocco Compact - Millennium Challenge Corporation". Mcc.gov. Retrieved 22 August 2018. ^ a b "Weather history for Fez, Figuig, Morocco : Fez average weather by month". Meoweather.com. Archived from the original on 5 June 2012. Retrieved 20 July 2014. ^ "Climatological Information for Fez, Morocco". Hong Kong Observatory. 15 August 2011. Retrieved 16 August 2012. ^ a b "Fes, Morocco - Climate data". Weather Atlas. Retrieved March 2, 2017. ^ "The normals data and climate variable descriptions are presented in these tables as provided by the WMO Member country" (TXT). Ftp.atdd.noaa.gov. Retrieved 22 August 2018. ^ "Recensement général de la population et de l'habitat de 2004" (PDF). Haut-commissariat au Plan, Lavieeco.com. Archived from the original (PDF) on 23 April 2012. Retrieved 22 April 2012. ^ Gaudio, Attilio (1982). Fès: Joyau de la civilisation islamique. Paris: Les Presses de l'Unesco: Nouvelles Éditions Latines. ISBN 2723301591. ^ 170. UNESCO. Retrieved January 22, 2018. ^ "Oldest higher-learning institution, oldest university". Guinnessworldrecords.com. Retrieved 22 August 2018. ^ "Medina of Fez". UNESCO World Heritage Centre. UNESCO. Retrieved 7 April 2016. ^ a b c d Penell, C.R. Morocco: From Empire to Independence; Oneworld Publications, Oct 1, 2013. pp.66-67. ^ Al-Qarawiyyin Mosque and University. Muslim Heritage. Retrieved January 22, 2018. ^ Shiratin Madrasa. Archnet. Retrieved January 23, 2018. ^ Fortifications of Fès. Archnet. Retrieved January 22, 2018. ^ Meredith, Martin. (2014). Fortunes of Africa: A 5,000 Year History of Wealth, Greed and Endeavour. Simon and Schuster. ^ Hakluyt Society, (1896). Works Issued by the Hakluyt Society, p.592. ^ Bab Bu Jallud. Archnet Retrieved January 22, 2018. ^ a b c نفائس فاس العتيقة : بناء 13 قصبة لأغراض عسكرية. Assabah. Retrieved January 11, 2018. ^ Le Tourneau, Roger (1949). Fès avant le protectorat : étude économique et sociale d'une ville de l'occident musulman. Casablanca: Société Marocaine de Librairie et d'Édition. pp. 74, 84, 107–108, 188, 265–266. ^ Qasbah Dar Debibagh. 'Archnet Retrieved January 22, 2018. ^ البرج الشمالي. Museum with no Frontiers. Retrieved January 22, 2018. ^ Chouara Tannery. Archnet. Retrieved January 22, 2018. ^ Why You Need to Visit Fez in 20 Photos. Bloomberg. Retrieved January 22, 2018. ^ Aziza Chaouni: Hybrid Urban Sutures: Filling in the Gaps in the Medina of Fez." Archit 96 no. 1 (2007): 58-63. ^ Abun-Nasr, Jamil (1987). A history of the Maghrib in the Islamic period. Cambridge: Cambridge University Press. ISBN 0521337674. ^ Sidi Ahmed al-Tijani Zawiya. Archnet. Retrieved January 22, 2018. ^ Métalsi, Mohamed (2003). Fès: La ville essentielle. Paris: ACR Édition Internationale. pp. 8, 273. ISBN 978-2867701528. ^ Jami' al-Qarawiyyin. Retrieved January 22, 2018. ^ Jami' al-Andalusiyyin. Retrieved January 22, 2018. ^ Masjid Ali Boughaleb. Retrieved January 22, 2018. ^ a b Fez. Archnet. Retrieved January 23, 2018. ^ Jami' Qasbah Filala. Retrieved January 22, 2018. ^ Métalsi, Mohamed (2003). Fès: La ville essentielle. Paris: ACR Édition Internationale. p. 188. ISBN 978-2867701528. ^ Abu al-Hassan Mosque. Retrieved January 22, 2018. ^ Hamra Mosque. Retrieved January 22, 2018. ^ Touri, Abdelaziz; Benaboud, Mhammad; Boujibar El-Khatib, Naïma; Lakhdar, Kamal; Mezzine, Mohamed (2010). Le Maroc andalou : à la découverte d'un art de vivre (2 ed.). Ministère des Affaires Culturelles du Royaume du Maroc & Museum With No Frontiers. ISBN 978-3902782311. ^ Rasif Mosque. Retrieved January 22, 2018. ^ Funduq al-Najjariyyin. Archnet. Retrieved January 22, 2018. ^ Fondouk Achich. Archnet. Retrieved January 22, 2018. ^ Alami House. Archnet. Retrieved January 22, 2018. ^ مدينة فاس. Ministry of Culture. Retrieved January 22, 2018. ^ UNESCO, World Heritage Listing for Medina of Fez. ^ Larbi Arbaoui, Al Karaouin of Fez: The Oldest University in the World, Morocco World News, 2 October 2012. ^ "Groupe scolaire Jean-de-La-Fontaine." AEFE. Retrieved on June 16, 2016. ^ "::.. Oncf ..::". Oncf.ma. Archived from the original on 2009-02-28. Retrieved 2009-05-05. ^ "Sister cities of İzmir (1/7)". Izmir-yerelgundem21.org.tr (in Turkish). Retrieved 2008-11-01. ^ "Acordos de Geminação". Cm-coimbra.pt (in Portuguese). Retrieved 2009-06-25. Le Tourneau, Roger (1974) . Fez in the Age of the Marinides. Translated by Besse Clement. Oklahoma University. ISBN 0-8061-1198-4. Vigo, Julian (2006). "The Renovation of Fes' medina qdima and the (re)Creation of the Traditional". Writing the City, Transforming the City. New Delhi: Katha. pp. 44–58. "Place Lalla Yeddouna A Neighborhood in the Medina of Fez, Morocco: International open project competition in two phases". Announced in September 2010 in collaboration with the Union International des Architectes (UIA) and the Millennium Challenge Corporation (MCC), to renew the area and upgrade the living and working standards of the artisans in the medina. The approach of the project is probably one of the most ambitious for an Arab medina and therefore of exemplary character. The open international project was won by the London-based architecture practice Mossessian & Partners. Portal dedicated to Fez. Online Since 2006. "Fez". Islamic Cultural Heritage Database. Istanbul: Organization of Islamic Cooperation, Research Centre for Islamic History, Art and Culture. Archived from the original on 2013-04-27. ArchNet.org. "Fez". Cambridge, Massachusetts, USA: MIT School of Architecture and Planning. Archived from the original on 2013-10-06. Abu Zaid Abd al-Rahman Abu Muhammad Ibn Abd al-Qadir al-Fasi (Arabic: أبو زيد عبد الرحمن أبو محمد بن عبد القادر الفاسي; c. 1631–1685) was a Moroccan writer in the field of law, history, astronomy and music. He wrote some 170 books and has been called the Suyuti of his time. He was a follower of his father, the Sufi saint Abd al-Qadir Ibn Ali Ibn Yusuf al-Fasi (1599–1680). Abu Zayd Abd al-Rahman Mohammed al-Jadiri (born in Meknes, in 1375 and died in Fez, probably in 1416) was muwaqqit (time-keeper) at the Qarawiyyin Mosque. He wrote a treatise on the determination of time of day and night, an urzija (verse composition) in 26 chapters and 335 verses, entitled Raudat al-azhar fl 'ilm waqt al-lail wal-nahar (1391/2) and a calendar adapted to the latitude of Fez Tanbllt al-afliím 'ala mii ya/:tduthu ji ayyiim al-'iim. Abdellatif Hammouchi (Arabic: عبد اللطيف الحموشي‎; born 1966 in Taza, Morocco) is the head of the Moroccan secret services, the DGST (Formerly known as the DST, French: Direction de surveillance du territoire). He is also an advisor to Mohammed VI on terrorism-related affairs. Abderrahmane Sbai (Arabic: عبد الرحمان السباعي‎ – 1940 – 22 October 2010) was a Moroccan politician and civil servant who was Delegate-Minister for the Administration of National Defense from 1997 to 2010. He held a degree in "geographic engineering".Born at Fes in 1940, he attended primary and secondary school in El Jadida. He died in Rabat in October 2010. Abu Thabit Amir (أبو ثابت عامر abū θābit ʿāmir) (1283 – 28 July 1308) was a Marinid ruler of Morocco for around a year. Son or grandson of Abu Yaqub Yusuf, whom he succeeded in 1307. Abu al-Hasan Ali ibn Muhammad ibn Abd al-Haqq al-Yalisuti az-Zarwili known as al-Sughayyir (died 1319 in Fez) was a qadi of Taza and later qadi of Fez. He was of Berber origin. Al-Zarwili wrote a commentary of 12 volumes (Sharh al-Mudawwana) on the Mudawwana by Sahnun ibn Said and was considered a "qutb" (axis of his age) by his contemporaries. Abul Qasim ibn Mohammed ibn Ibrahim al-Wazir al-Ghassani al-Andalusi (1548–1610) was a famous physician at the Saadian court. He studied medicine with his father. He lived in Marrakesh and Fez and was of Morisco descent. It is probable that he was the author of Hadiqat al-azhar fi mahiyyat al-ushb wa-l-aqqar (Garden of Flowers in the Explanation of the Character of Herbs and Drugs), a treatise on pharmacology and botany. A hospital in Fez was named after him. He was sent by the Moroccan Sultan Mulay Zaidan as an envoy to the Low Countries. He was followed in this role by Al-Hajari, and later Yusuf Biscaino.Muhammad Alguazir was also the author of an anti-Christian polemical work, Apología contra los artículos de la ley Cristiana, written at the order of Mulay Zaidan. Abul-Abbas Ahmad ibn Ali al-Mandjur al-Miknasi al-Fasi (1520–1587, born and died in Fes) was a Moroccan scholar of theology and law and a prominent teacher at the Qarawiyyin University. He is known to have educated qadis for several Moroccan towns. Between 1579 and 1585 he spent much time in Marrakesh, where he taught the Moroccan sultan Ahmad al-Mansur. He is the author of theological commentaries and especially his fahrasa (account of his scholarly career) is of great renown. He was the father of the well-known writer Ahmad Ibn al-Qadi. Al-Qasim Guennoun ibn Ibrahim (Arabic: القاسم كنون بن محمد الباكماني‎ al-Qāsim Kanūn bin mohammad) was the eleventh Idrisid ruler and sultan of Fes. He took over after the Fatimid overlordship by Ubayd Allah al-Mahdi Billah in 937 until his death in 948. Ali ibn Muhammad ibn Idris (Arabic: علي بن محمد بن إدريس‎) was the fourth Idrisid sultan of Morocco. He was the son of Muhammad ibn Idris whom he succeeded in 836. He died in 848 CE (Rajab 234 AH) and was succeeded by his brother Yahya I.
Abu al-Hasan Ali ibn Mohammed ibn al-Qattan al-Fasi (died 1231) was an imam, a hadith scholar and one of the leading intellectuals of the time of the Almohad dynasty in Morocco. He was born in Cordoba and lived in Fes. He is the author of Kitab al-nazar fi ahkam al-nazar bi-hassat al-basar and Bayan al-Wahm wa al-iham al-waqi'in fi kitab al-ahkam. Chakib Benmoussa (Arabic: شكيب بن موسى‎) (born 1958, Fes) is a former Interior Minister of Morocco and the lead negotiator for the Moroccan side in the Western Sahara conflict. The Fez Sports complex (Arabic: المركب الرياضي لفاس‎) is a multi-purpose stadium in Fez, Morocco. It is currently used mostly for football matches and it also has athletics facilities, the stadium holds 45,000 and was built in 2003. Saïss Airport or Fès–Saïss Airport (Arabic: مطار فاس سايس الدولي‎) (IATA: FEZ, ICAO: GMFF) is an airport serving Fez, the capital city of the Fès-Meknès region in Morocco. The airport was finally able to cross the million passengers mark in 2017 for the first time of its history by totalising 1,115,595 travelers. Abū al-Hassan ‘Alī ibn Abī Zar‘ al-Fāsī (Arabic: أبو الحسن علي بن أبي زرع الفاسي‎) (d. between 1310 and 1320) is the commonly presumed original author of the popular and influential medieval history of Morocco known as Rawd al-Qirtas, said to have been written at the instigation of Marinid Sultan Abu Sa'id Uthman II. His full nasab is sometimes given as ibn Abd Allah ibn Abi Zar and sometimes as ibn Muhammad ibn Ahmad ibn Umar ibn Abi Zar. The uncertainty about his name and authorship of the Rawd is caused by the many variant manuscripts in circulation since the Middle Ages. Very little is known about his life except that he was evidently a scholar at Fes. Ibn Ashir (1582 – 1631 CE) (AH 990 – 1042 AH ) known as Imam Ibn Ashir or simply Ibn Ashir was a prominent jurist in the Maliki school from Fes. His Murshid al-Mu'een is arguably the best known of the Maliki texts in the Islamic world. It is still widely sung and memorised in madrasas and Quranic schools throughout North Africa to this day. Abu Abdallah Muhammad b. Ahmad b. Muhammad Ibn Ghazi al-'Utmani al-Miknasi (1437–1513) was a Moroccan scholar in the field of history, Islamic law, Arabic philology and mathematics. He was born in Meknes from banu uthman, a clan in the Berber kutama tribe, but spent his life in Fez. Ibn Ghazi wrote a three-volume history of Meknes and a commentary to the treatise of Ibn al-Banna, Munyat al-hussab. For an explanation of his work, Ibn Ghazi wrote another treatise (about 300 pages long) titled Bughyat al-tulab fi sharh munyat al-hussab ("The desire of students for an explanation of the calculator's craving"). He included sections on arithmetic and algebraic methods. He is also the author of Kulliyat, a short work on legal questions and judgements in the Maliki madhab. Maghreb Association Sportive de Fès (Arabic: المغرب الرياضي الفاسي‎) is a Moroccan football and basketball club based in Fes. The club was founded in 1946. Abu Abd Allah Mahamad ibn Ahmad Mayyara (1591–1662) was a jurist and theologian from Fes, one of the most reputable scholars of his time. He is the author of a commentary on the Tuhfa by Ibn Asim, a commentary on Al-Musrhid al mumin by his teacher Ibn Ashir and Sharh al-Shaykh Mayyara li-Lamiyya al-Zaqqaq, a commentary on al-Zaqqaq's Lamiyya. Mayyara's Nazm al-la'ali wa-l-durar contains a fahrasa and hence biographical information about himself. Well known is also his work called Nasihat al Mughtarrin in defence of Bildiyyīn (Muslims, like himself, of Jewish descent) whose position had been deteriorating after the death of Ahmad al-Mansur in 1603.